room with ping pong and pool table. secluded cabins only. Pets welcome! Pontoon boats, bass boats, deck boat and row boats. Recreation room and on site provision store. Less than 10 miles from Golf shopping and dining. This cabin #15 is only one of 17 cabin rentals available at Rocking Chair. 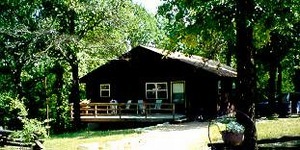 We also have secluded cabins with fireplace and lake views on 5 acres. slide located next to recreation room and laundry room. 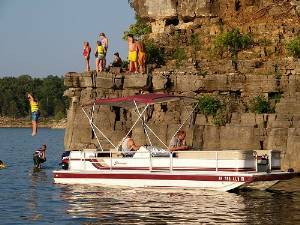 We have bass boats, pontoon and a 150 hp deck boat rentals available. Lake Norfork has 550 miles of shoreline. My Family and I have been visiting Rocking Chair for the past 20+ years. We have always enjoyed the resort. We started with our kids and now out kids and our grand kids go and extended families. We have had as many as 18 family members in various cabins on the property. All loved being there. Bob and Jane are great and very accommodating. We will be back there this year again, We just love the relaxed feeling. We have been going to the Rockingchair Resort for about 16 years-I started going just with my friend Phil,he was a stripper fisherman.I go now with my kids and Grandson,Drew. And even take my kids friends and friends from work. Last year we had 3 cabins all together. We all had a GREAT time.Love the pet friendly,because take a few of our pets now--they are family. Love the dock location-lots of crappie there to be caught---save some for me please-we are going back in July again this year. Owners are the GREATEST-always enjoy the conversations and friendly atmosphere-Drew loves the pool the most. Great swimming dock on the lake. JUST A GREAT PLACE TO VACATION. We stay in the cabins-we want to be close to all the great times. Owners always helping us if we need it. THANKS BOB,JANE,RICH AND ALL THE KIDS. January 19, 2013 Reviewer: Tom Wold From: West Chicago, Il. We have been going to Rocking Chair for about 10 years now. You won't find friendlier owners or a more rerlaxing good time than on Lake Norfolk and Rocking Chair. They have a greaty pool and the best dock locations on the Lake. I look forward to returning there every summer. Rocking Chair Ranch is a secluded forty acre retreat with individual cottages situated amongst majestic oaks and pines trees. 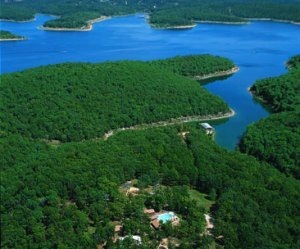 The resort butts up to a private cove that is the gateway to Lake Norfork. 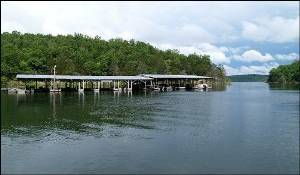 The resort has a private covered dock which offers boats, motors and equipment that could be the key to the lake. Lake Norfork has 550 miles of shoreline that encompasses 22,000 crystal clear lake that is the answer to a vacationer‘s dream. Rocking Chair Resort offers serenity and privacy that are second to none. 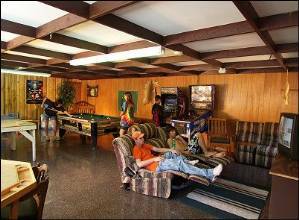 There are 22 cabins that offer all the comforts of home .The amenities include an over-sized pool, game room, along with basketball courts. Besides the actual resort there are hiking trails, a golf course, and theatre nearby. Rocking Chair Resort means family and its mystique is what draws its guests to return. 2010 will be our 24th year and we are looking forward to meeting our many friends, which will make our vacation complete. With many oppurtunities to upgrade to the newer condos or houses we choose to stay in the older original cabins, cause that is where all the socializing takes place. We have been coming to the resort for 15 years and always had a great time.The owner's are helpful and friendly. We love that it is pet friendly. We hardly ever leave the resort, but if we need to the stores are not far. There is always something to do no matter what your age. The lake is beautiful and the fishing is awesome! Robinson Point Road, Mountain Home, AR 72653 for a great vacation spot. The resort offers beautiful, clean, stocked cabins, built in swimming pool, lake, boats, game room and large resort for kids to run around and just have fun. We have been going there for many years and my kids never get tired of it. 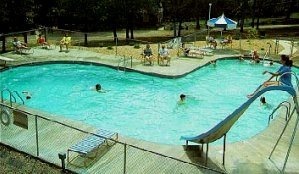 Rocking Chair Resort is a GREAT place for a family vacation because it has something for everyone! The last time we went to Rocking Chair Ranch in Arkansas was summer of 2006. We are going again in 2008. We have been there about 16 times over the years and just love it. The first time we went was the first year Jane and Bob owned it. 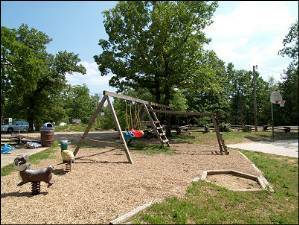 They have done a lot there in adding new cabins and activities. A perfect place to relax, swim, boat and fish and visit with the owners. They do so much to make the resort a great vacation place. We really miss it when we don't go in the summer. I would recommend it to anyone who wants a good vacation. I have been staying at the Rocking Chair for over 12 years. At least once a year and sometimes more. I do not believe there is a more comfortable place to stay - anytime of year. The cabins are excellent. The dock is perfect for fishing, swimming or hanging out. The slips for private boats are covered and well lit. 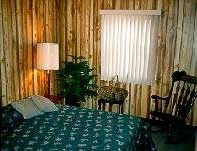 Anyone staying at the Rocking Chair will certainly wish to return. 5% discount on cottages and equipmentfor 2-week stays. 8% discount in fall & winter for seniors over 60. Pets welcome for additional charge of 10 daily or $50 weekly. Owners Special and Late Summer rates are based on 4 person 2 bedroom cabin. Deposit: $200.00 deposit for each week reserved. $300 deposit per cabin when renting 3 or more cabin. balance due upon arrival. 50.00 deposit on boat rentals. Cancellations and Refunds: In case of cancelation deposits refunded upon rental of your cabin less $20 fee. Required Stay: Saturday to Saturday, Summer.